Google CEO Sundar Pichai has announced Google Lens, a new kind of smart camera technology that combines Google's machine learning with what you're pointing your smartphone at. Digitally removing a chain link fence, completely showing a baseball player unobscured. Identifying a certain kind of plant just by taking its picture. Connecting to a local Wi-Fi network simply by snapping the router's SSID and password sticker. Bringing up search and review results of restaurants and other businesses in the view of your picture. Google Lens also syncs with Google Photos to provide an extra layer of abilities even after you've taken your pics. For example, you can look back at an image stored in Photos of, say, a skyscraper you saw during your last trip or a painting seen in a museum and then identify is as the Sears Tower or a Georges Seurat original when you get back home. 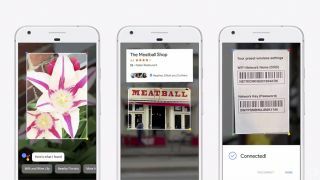 You can also use Google Lens to recognize a screenshot you took of a company's website on Google Photos, which can then pull out a phone number or address and have you getting in touch with just a single, well, touch. Google Lens support for Google Photos is planned to roll out later this year. Needless to say, we're already quite excited at its possibilities. Follow our liveblog for more from IO 2017!